Image-guided therapy is a clinical procedure under 2-D or 3-D image guidance such as MRI and CT images to accurately deliver surgical devices to diseased or cancerous tissue. This emerging field is interdisciplinary, combining the technology of robotics, computer science, engineering and medicine. Image-guided therapy allows faster, safer and more accurate minimally invasive surgery and diagnosis. In this talk, Dr. Tse will present the technological challenges in the field, followed by his research in MRI-guided cardiac electrophysiological catheterization as well as prostate cancer diagnosis and ablation. These procedures consist of the latest imaging and robotic technology in minimally invasive therapy. 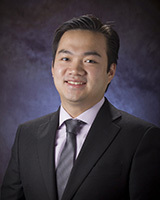 Dr. Zion Tse is an Assistant Professor in the College of Engineering and the Principal Investigator of Medical Robotics Lab at the University of Georgia. Formerly, he was a scientist at the Center for Interventional Oncology at National Institutes of Health, and Radiology Department at Harvard Medical School. He received his PhD in Medical Robotics from Imperial College London, UK. His academic and professional experience has related to mechatronics, medical devices and surgical robotics. Dr. Tse has designed and prototyped a broad range of novel clinical devices, most of which have been tested in human trials. His professional goal includes applying his strong medical mechatronics background in the healthcare field, especially in the realm of medical devices.